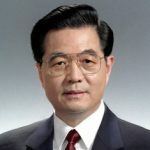 Hu Jintao was born in Taizhou, Jiangsu, China. He is a Chinese politician who was the paramount leader of China between 2002 and 2012. He held the offices of General Secretary of the Communist Party from 2002 to 2012, President of the People's Republic of China from 2003 to 2013 and Chairman of the Central Military Commission from 2004 to 2012. Hu is the first leader of the Communist Party without any significant revolutionary credentials. He graduated from the Water Conservancy Engineering Department of Tsinghua University, where he had a major in the study of hub hydropower stations. In 1968, he worked on the construction of Liujiaxia Hydroelectric Station. From 1969 to 1974, he worked for Sinohydro Engineering Bureau, as an engineer.